ASTON VILLA ARE in the market for a new manager following Gerard Houllier’s announcement last night that he will have to step down from his post for health reasons. The Frenchman, who only joined the club in September of last year, missed the final five games of the Midlands club’s Premier League run-in due to heart problems. 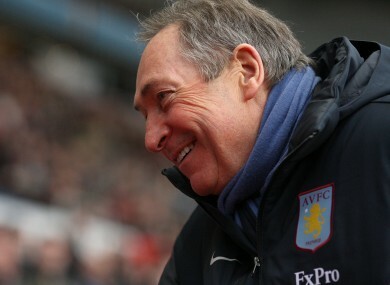 Following suggestions earlier this week that the manager’s resignation was imminent, Villa chief executive Paul Faulkner last night confirmed Houllier’s departure and wished him a speedy return to full health as he continues his recovery. “I am extremely disappointed that I will not have the opportunity to manage Aston Villa next season,” the 63-year-old former Liverpool boss said in a statement last night. My health has improved considerably since I was taken ill on April 20. I now intend to take the next few months to concentrate on recuperating fully before I may return to football. Speculation has already started to mount regarding Houllier’s successor in the Villa Park hotseat, with Fulham boss Mark Hughes believed to be at the head of owner Randy Lerner’s preferred list of candidates. We take a look at the pros and cons of some of the names who have already been linked with the role this morning. Email “Hou's next for the Villa Park hotseat?”. Feedback on “Hou's next for the Villa Park hotseat?”.